Montessori environment evolves and changes together with the child. As the child grows and develops, so does his or her environment. It slowly adapts to meet child’s needs for independence and to provide sensory stimulation. 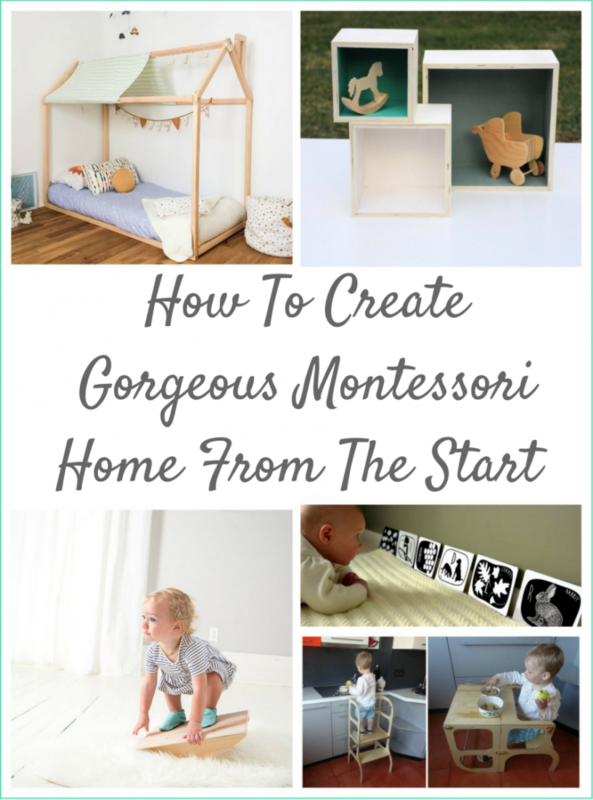 Montessori environment set up has a distinct difference – it is very orderly and structured. It is easier to progress from one stage of child’s development to the next if child’s space was organised and set up in such manner. 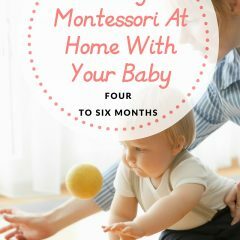 Plus Montessori method offers support and advice for every stage of child’s development in the first year of life – month by month. 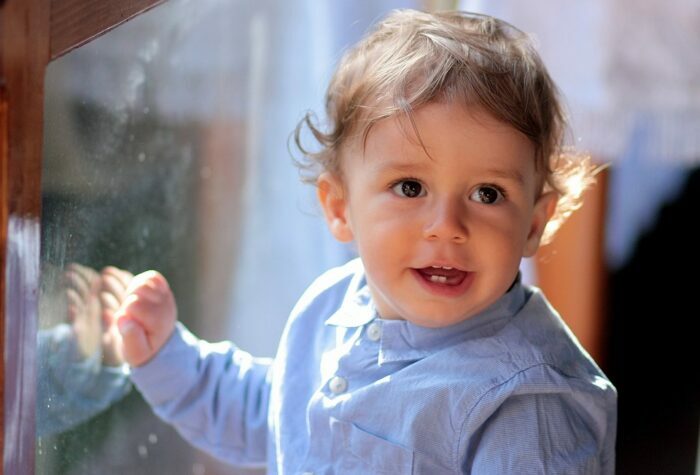 It lays the perfect foundation for the first early years of child’s life, and we all know how crucial these are for child’s future mental and physical health. 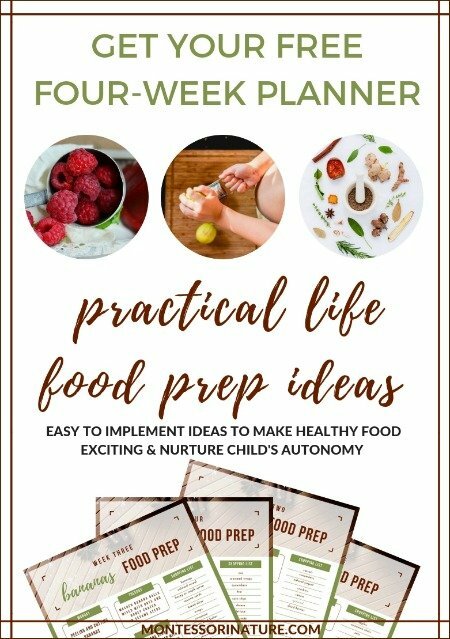 I would like to offer you practical suggestion on how to arrange and set up your baby’s space to support their natural desire for freedom of movement, sensory stimulation, order, independence and beauty. All recommendations are handmade. You can find out more by visiting the webpage of each product. Floor bed – generally for babies from 3 months and up. We used something similar with our babies. However, a safety rail was a must since our babies rolled from side to side at night a lot. I love floor bed frames made by Sweet Home From Wood because they also allow to hand up mobiles very comfortably for the baby during waking hours. Mobiles. Mobiles help babies from week one exercise eye focus and concentration. Montessori mobiles change as baby’s abilities develop. Bella’s Casa offers handmade mobiles for babies ages 0-12m. Wall Art. From birth, it is suggested to use black and white images. Images are attached to the wall on baby’s eye level, on the side of the changing table or above it if possible. For older babies – images with black/white/red patterns. From 4 months and up, as an example, you can use images with fine art and animals. This collection made by Hello Sprout is gorgeous. Another beautiful Word Art from the ART of TYPE for children who are a bit older. Baby Gym is an excellent alternative for hanging mobiles. Handmade wooden baby gym from Clover And Birch looks perfect. It is especially convenient since it can be easily folded and put away when not in use. Low shelves. 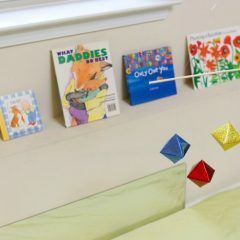 I think using cube floor shelves is genius for little ones. These can be later used for various purposes. This set made by Little wood tales grabbed my attention. Floor cushions are great for babies before their rolling stage. They become beautiful spots for day naps and also great for the awake time when placed low above the ground, just like one made by Blue House Joys. We have one of those, and our baby used to love falling asleep there during the day. Now it’s a perfect addition to a book corner. Play Mat. Who doesn’t like a feel of a soft cotton play mat for their baby to rest on? These can be an excellent addition to a spot next to the mirror or under a baby gym. This play mat by Nikko is lovely and looks very cosy! Nursery Storage Baskets will always have great use in child’s room. First, as a place to keep nappies, baby cream, and other baby items. Later these can hold books or serve as a place to display materials on shelves. Montessori Infant Gift Set by Natura Baby. This is a lovely set that will serve as a part of Practical Life area of development. Weaning Table and Chair. Weaning process starts typically around 6 months of age. This is the time when usually baby is given first foods and can do first simple activities while sitting at the table. Ettetete made a great set that serves a dual purpose: weaning table and chair AND can be transformed into a Learning tower for helping in the kitchen when the child is older. Montessori Inspired Child’s Placemat is another must-have in a Montessori home. Here is a beautiful handmade example by Honey Bee Toy And Craf. Pull Up Bar. Once baby starts attempting to pull themselves up, parents can attach an infant pull up bar to assist the child in developing their muscles and arm strength. Montessori Wood Works has one to offer. Baby Clothes ideally should be in plain and soft colours, made out of soft natural materials and allow total freedom of movement. It is recommended that babies and children walk barefoot when possible or wear shoes with non-slippery leather soles. Baby Essential Massage Oils. 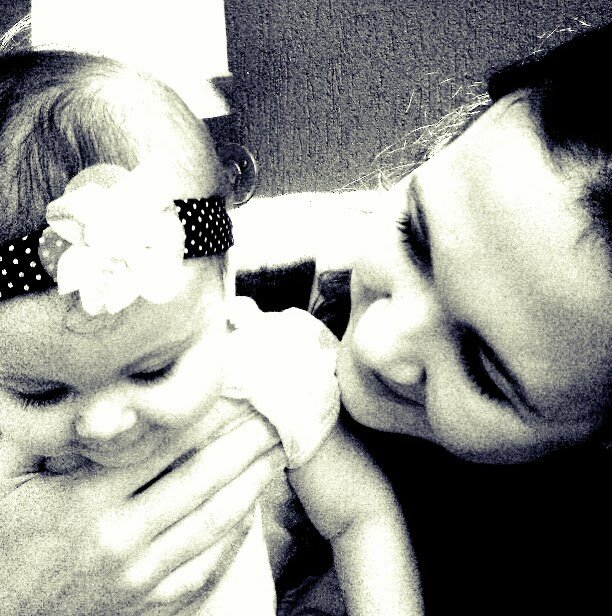 Babies enjoy daily massages, plus it creates valuable opportunities for bonding with your little treasure. Tash Monster Oils offers a organic essential oil rollers for baby. Please, make sure that your child is not allergic to any of these before applying on your baby’s skin. I hope you got inspired by the example of these talented craftsmen who created handmade items for people to set up beautiful and mindful spaces for their little ones. Visit Etsy for more inspiration! Love all of these great finds! Just came across this post and saw our reading nooks featured as one of the items. Thanks so much for including us in this round up.